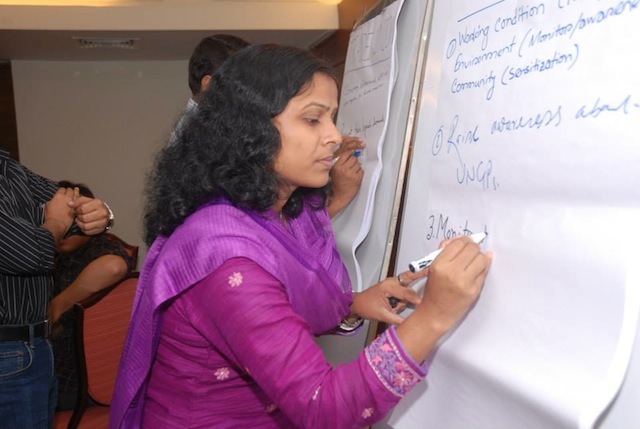 On May 12-15, SAI, the Danish Institute for Human Rights (DiHR), and the CSR Centre Bangladesh jointly convened two segments of the Pillars in Practice (PIP) Program in Dhaka - a 'Training of Trainers' (ToT) and the "Multi-Stakeholder Advisory Consultation" (MAC) forum to discuss the garment sector's impacts on human rights in Bangladesh. Looking exclusively at the ready-made garment sector in Bangladesh, both sought to advance the implementation of the UN Guiding Principles for Business and Human Rights by government ministries, garment manufacturers, trade unions, and civil society organizations. SAI India Program Director Rishi Sher Singh and Development Manager Eliza Wright joined Shahamin S. Zaman, CEO of the CSR Centre to co-facilitate these two program segments. Dirk Hoffmann from the DIHR joined via teleconference. The two-day 'Training of Trainers' segment included lectures and group activities to analyze each of the three pillars of the UN Guiding Principles on business and human rights: 1) the governments duty to protect human rights; 2) the corporate responsibility respect human rights; and 3) and access to remedy. Both the two-day ToT segment and the MAC began with a moment of silence to acknowledge the victims of the Rana Plaza building collapse. Ms. Wright noted, "At the time, the local media reported the death toll at 1,117. We wanted to pay our respects and convey our sympathies collectively for the loss of life at Rana Plaza. 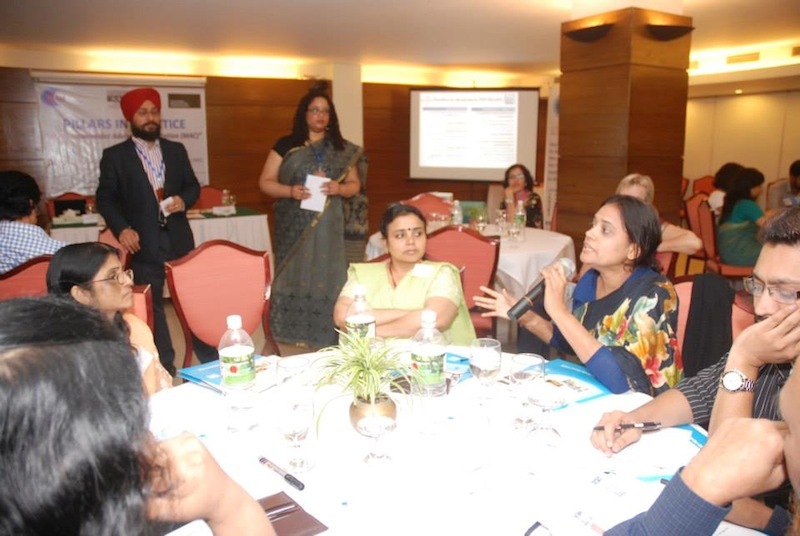 We believe that this set the tone for our substantive discussions." The ToTs segment trained 10 participants - 5 from the CSR Centre including its CEO Shahamin S. Zaman, and 5 mid-level managers from 4 garment factories who are responsible for compliance and human resources. On the second day of the ToT segment, people stayed past the planned 3:30 pm end time until 5:30 in the evening. Mr. Singh noted, "One of the participants commented that this was the first time reading the 30 Articles of the International Declaration on Human Rights. It was very moving to hear this." Garment Factories/Industry Associations: DBL Group; Viyellatex Group; Dhaka Chamber of Commerce and Industry (DCCI); Arche Advisors; ABS; Epyllion Group; AZIM Group; Youngone Corporation; Business Initiative Leading Development (BUILD); Pou Hung; M.A.C.K. Shirts; Atrium Group; Square Fashions; Xinchang Shoes; Bay Footwear Ltd.
MAC participants agreed on the importance of respecting all human rights and identified the following five human rights issues as priorities for the garment sector: working conditions, trade union issues (freedom of association and the right to collective bargaining), occupational health and safety, environment, security and conflict. "Developing countries should work together in improving workplace conditions, this is certainly not an area of competition!" said Mr. Singh. "Collective approach is needed at the end of the day." The Bangladesh garment industry is one of three countries and sectors in which the PIP Program works to advance the UN Guiding Principles. In April 2012, the PIP Program convened these two segments in Nicaragua focused on the agriculture sector, and in July 2013, it will convene others in Zimbabwe focused on the mining sector. 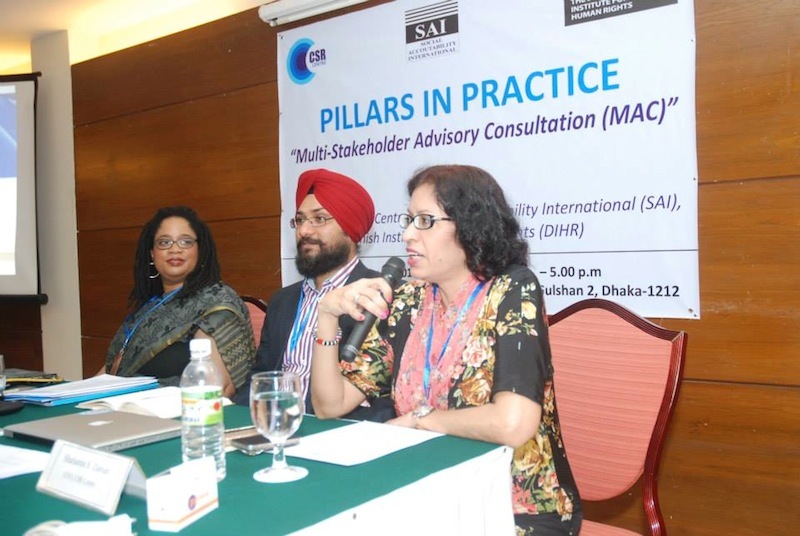 About the Pillars in Practice Program: The Pillars in Practice (PiP) Program of SAI and the Danish Institute for Human Rights (DIHR) works to build the capacity of civil society organizations (CSOs) in Bangladesh, Nicaragua and Zimbabwe, to engage with and train on the UN Guiding Principles on Business and Human Rights (GPs). The program aims to activate a strategic alliance by establishing the training capacity of CSO partners in each of the three countries to sustainably promote and assist in the implementation of the GPs by local and multi-national companies, government agencies and other local CSOs. The PIP Project is funded by the U.S. State Department. Follow the project on Facebook at www.facebook.com/pillarsinpractice.